Adherence to behavioral weight management programs is often limited, especially among ethnic minority populations. 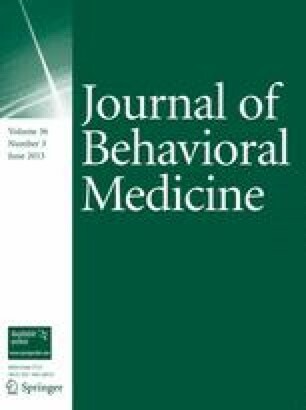 The current study examined whether attitudinal familism, or attention to the needs of family above those of the self, predicted poorer adherence to a behavioral weight management program in Mexican–American women. One-hundred overweight or obese Mexican–American women from the southwestern United States were enrolled in a group-based weight loss treatment. Zero-order correlations indicated that general commitment to attitudinal familism, as measured by the Attitudinal Familism Scale, was significantly negatively associated with calorie and physical activity goal completion and marginally negatively associated with session attendance. The results of the current study indicate that researchers may consider addressing familism when developing tailored weight management interventions for Mexican–American women. This research was supported in part by an American Psychological Association Minority Fellowship Program Dissertation Grant, a University of New Mexico Graduate Research and Development Grant, and a University of New Mexico Robert Wood Johnson Foundation Center for Health Policy Dissertation Fellowship. The authors also thank the New Heart Center of New Mexico and its staff for use of their facilities and clerical support. We are grateful to research assistants Jessica Alsup, Christine Tally, Alee Cavanaugh, Lucia Cordova, and Allison Conway, and therapists Jenny Rinehart and Kathryn Lenberg, Ph.D. We also thank the following individuals for their commentary on the project manuscript: Joel Yager, M.D., Eric Levensky, Ph.D., Steven Verney, Ph.D., and Bruce Smith, Ph.D.
Centers for Disease Control. (2007). Overweight and obesity: Introduction. Retrieved May 22, 2007 from http://www.cdc.gov/nccdphp/dnpa/obesity/index.htm. National Institute of Diabetes and Digestive and Kidney Diseases. (2007).Complications of diabetes. Retrieved April 20, 2007 from http://diabetes.niddk.nih.gov/complications/index.htm. Pew Hispanic Center. (2011). The Mexican-American boon: Births overtake immigration. Retrieved October 4, 2011 from http://pewresearch.org/pubs/2058/-immigration-mexican-immigrants-mexican-american-birth-rate. Telles, E. E., & Ortiz, V. (2008). Latino policy & issues brief: Mexican-American culture and language (No. 21). Retrieved October 4, 2011 from http://www.chicano.ucla.edu/press/briefs/documents/PB21.pdf. U.S. Census Bureau. (2004). We the people: Hispanics in the United States. Retrieved October 4, 2011 from http://www.census.gov/prod/2004pubs/censr-18. U.S. Census Bureau. (2010a). Median income in the past 12 months (In 2010 Inflation-adjusted dollars): 2010 American Community Survey 1-Year Estimates. Retrieved October 4, 2011 from http://factfinder2.census.gov/faces/tableservices/jsf/pages/productview.xhtml?pid=ACS_10_1YR_S1903&prodType=table. U.S. Census Bureau. (2010b). State and county quickfacts. Retrieved April 7, 2010 from http://quickfacts.census.gov/qfd/states/35/35001.html.